Sarah Hall is a professional makeup artist based in Los Angeles. She works on various movie sets and photoshoots, and has worked on projects with some of Hollywood's top talent including Mark Hamill and James Franco. As Sarah started growing in her experience and reputation, she needed someplace to showcase her work. As a makeup artist, Sarah was starting to get more gigs on movie sets, but was advised by her mentor that she needed a website to be taken more seriously. Up until then, Sarah just had an Instagram account to showcase all the photos of her work. SparkFlow created a website that is completely white with simple, black text. Sarah just needed a text resume and galleries of photos. The images are displayed in a masonry layout - it's great for accommodating photos of different size ratios, but keeping them all lined up nicely in a grid. The entire site is responsive, so the galleries resize for mobile devices. A masonry image grid shows photos in an engaging way. The site is built in Wordpress so that Sarah, who self-admits as not being technologically-savvy, can easily add new photos on her own. 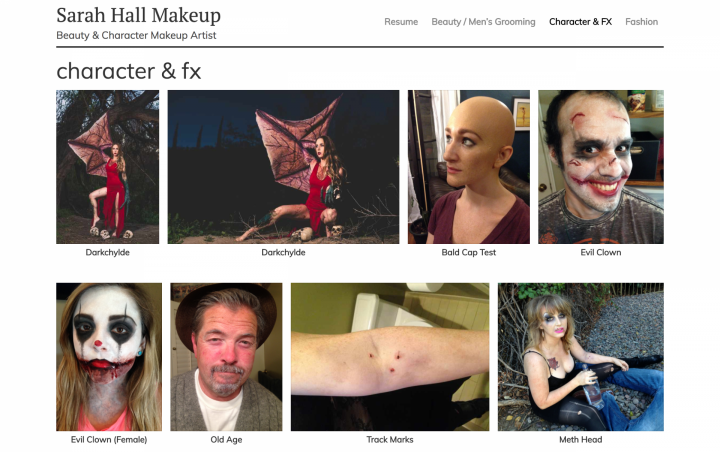 Sarah ended up with a website that showcases all her makeup work in different categories, in a simple and professional site. If you're in an industry where getting new work is based on your existing work, then it's time to get serious about your website. You have incredible projects to display, so put it on a clean website that shows your work front and center. Learn how a new web design can get you more contracts and clients.